Wildfires and guns: should steel bullets be outlawed? 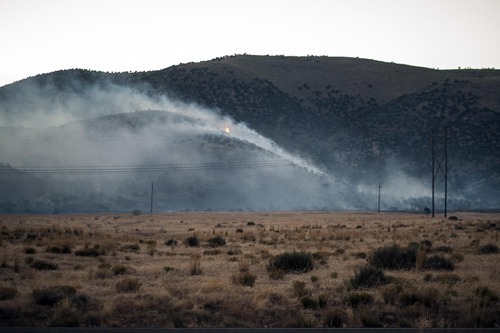 Outdoor safety • Target shooting sparked 18 Utah wildfires last year, prompting an investigation. Chris Detrick | Tribune file photo The AR Fire burned about 1,600 acres on the west shore of Utah Lake in May and June of 2012. Chris Detrick | Tribune file photo The AR Fire burned about 1,600 acres on the west shore of Utah Lake in May and June of 2012. Chris Detrick | Tribune file photo The AR Fire burned about 1,600 acres on the west shore of Utah Lake in May and June of 2012. Chris Detrick | Tribune file photo The AR Fire burned about 1,600 acres on the west shore of Utah Lake in May and June of 2012. Investigators determined it was started by target shooting. Chris Detrick | Tribune file photo The AR Fire burned about 1,600 acres on the west shore of Utah Lake in May and June of 2012. Investigators determined it was started by target shooting. Chris Detrick | Tribune file photo The AR Fire burned about 1,600 acres on the west shore of Utah Lake in May and June of 2012. Investigators determined it was started by target shooting. At the end of last year year&apos;s dry spring, two men fired an AK-74 assault rifle and a 9 mm handgun at wood and steel targets they set up in Burnt Canyon off Utah Lake&apos;s west shore. It was a hot windy day and the grasses were dried out, although it was still May. 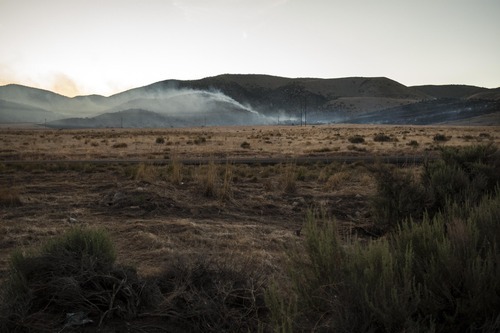 The rifle&apos;s steel-jacketed 5.54x39 mm ammunition likely triggered a fire that burned more than 1,600 acres and cost $33,000 to knock down, according to Jason Curry, a fire investigator with the Utah Division of Forestry. For years, investigators have suspected ricocheting bullet fragments ignite fires, after an impact with a hard surface converts the round&apos;s kinetic energy into searing heat. But there was little scientific basis for understanding how until now. Research forester Mark Finney decided to develop the science after gunfire was implicated in numerous Utah fires last year. A member of the U.S. Forest Service&apos;s Missoula Fire Sciences Laboratory, Finney assembled a team that demonstrated copper and steel ammunition reliably ignite fine, dried fuels. "Awareness that it can happen is the most important thing," said Finney, a lifelong target shooter. "If people are aware that it can happen and here&apos;s why, they will make safer choices." Finney&apos;s team recorded impacts scattering fragments that reached temperatures as high as 1,500 degrees. Lead-core bullets caused ignition, but not nearly as often as bullets with steel cores or jackets. "This helps verify our findings from investigations in years past," Curry said. "What we hear is, &apos;I stopped to reload and suddenly there is a fire right there.&apos; That scenario has played out time and time again." The shooters who triggered the fire last May noticed smoke rising from the grass several feet from the targets. They stomped the flames to no avail and the blaze spread into what was soon dubbed the AR Fire  an apparent reference to the U.S. analog of the Soviet AK-series rifles. The Bureau of Land Management promptly acted on Finney&apos;s findings, which have yet to be submitted for publication in the peer-reviewed literature, and last month banned the use of steel ammo on public land in Utah. But one bullet manufacturer questions the practicality and fairness of outlawing steel. "The Forest Service does a good job of educating the public about fire dangers. Let&apos;s take those same steps and put them toward ammunition. Shooters should be aware, but so should someone starting a campfire or parking their car in dry grass," said Jessica Brooks-Stevens, marking director for Mona-based Barnes Bullets. "We don&apos;t ban smoking, we alert them to the dangers. Bans don&apos;t work. We see that with the lead ban in California. The regulation is almost impossible." BLM officials say their interest is helping shooters stay out of trouble, not fining them. "It&apos;s a good place to start a discussion. 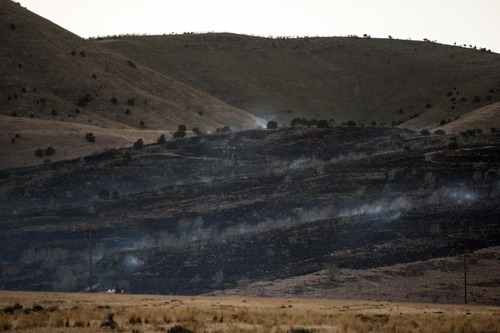 In a lot of ways it&apos;s about the time and place where you shoot," BLM fire investigator Teresa Rigby said. The Utah BLM order also bans exploding targets and tracer rounds, and shuts down several areas to shooting, including the North Oquirrhs, Fivemile Pass and Utah Lake&apos;s west shore. These incendiaries are also banned on all national forests, as well as on Utah&apos;s state and private land in unincorporated areas. The BLM does not ban copper bullets, which are considered high-end hunting ammo that few would squander on targets. Target shooters sparked at least 18 wildfires in Utah last year, burning nearly 11,000 acres, according to BLM data. Most occurred in Utah and Tooele counties and included the 5,507-acre Dump Fire, which threatened to burn subdivisions in Saratoga Springs. Shooting has been a problem in Arizona. Since 2010, target shooting has ignited 30 fires on the Tonto National Forest, mostly on the Mesa Ranger District outside Phoenix, according to the forest officials. The Forest Service has not banned steel ammo on its lands. To figure out how bullets behave when they strike hard surfaces, Finney improvised an apparatus that deflected slugs off an angled steel plate into a box filled with oven-dried peat moss. "We had no guidance. There has been no study like this before. We didn&apos;t even know if we would see any ignitions. If it&apos;s so rare we may not have an experimental design sensitive enough to see it," Finney said. "We put it up and, by golly, when we started shooting, we would get ignitions every time." So his team tweaked the experiment to determine whether bullet type was an ignition factor. His team examined lead, steel and copper ammunition of varying caliber and fired from rifles at a distance of 35 yards. Almost 500 rounds were fired in the course of the experiment, which did not study handguns or shotguns. Using high-speed videography and thermal cameras, Finney characterized how the bullets fragmented, depending on caliber, composition and deflection angle. Bullets composed of steel cores or jackets and of solid copper expelled fragments that were more than hot enough to start fires, but they cool quickly. "They have to bounce into something ignitable in a fraction of a second," Finney said. BLM&apos;s Rigby has investigated fires every summer over her 13 years in Utah where gunfire played a role. Military-surplus ammunition, which commonly contains steel components, was often involved, like the time a group of guys firing a Bushmaster and another assault rifle triggered the 23-acre Miners Fire on March 10 last year. "It&apos;s not that we don&apos;t want people out target shooting," Curry said. "In general, the shooting community is a safe bunch. We encourage them to look for one more factor when they are examining their backstop. Look for rock and dry grass." Target shooting triggered at least 18 wildfires in Utah last year, burning more than 10,000 acres. The Utah BLM this year banned the use of steel ammunition on public land after research found bullets with steel jackets and cores are more likely to ignite a fire than other types of bullets. Fire officials advise shooters to use soft targets and aim away from dry vegetation, and have water, a fire extinguisher and a shovel ready. Exploding targets and tracer ammunition are generally prohibited on public land.